Total Global Sports hosts hundreds of youth sporting events all over the country bringing thousands of people into communities. TGS Food & Entertainment allows you to promote your business in a great community program. Set up large or small group reservation options for teams and families. Create custom offers or deals, set a cap on units sold, or add other fine print. Utilizing the mobile app and web you can pre sell offers to attendees. Total Global Sports host’s hundreds of youth sporting events all over the country bringing thousands of people into communities. 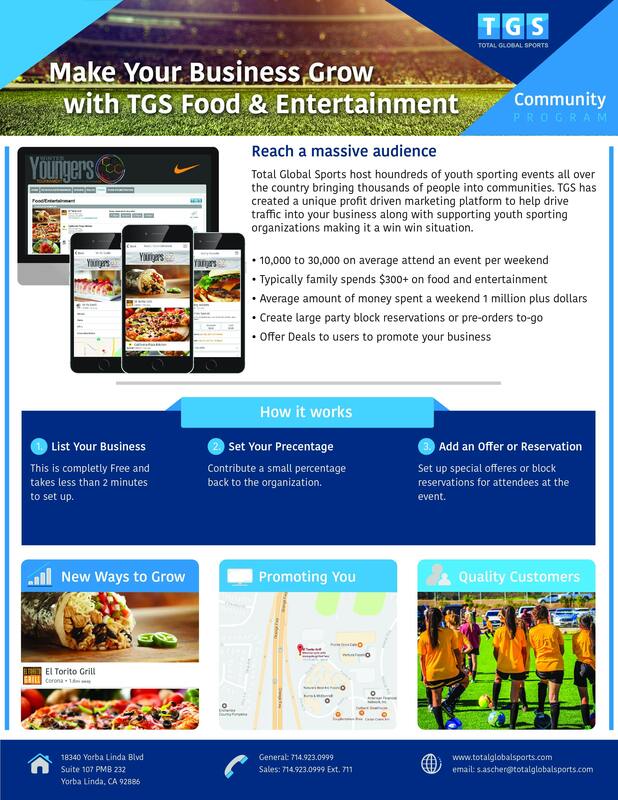 TGS has created a unique profit driven marketing platform to help drive traffic into your business along with supporting youth sporting organizations making it a win win situation. The TGS system helps build brand awareness and capture revenue with a local marketing campaign that works for you. 10,000 to 20,000 on average attend an event in your local area. The typical family will spend $300+ on food and entertainment while attending the event. Make sure you do not miss out on attracting customers to your business by signing up today! List your business for FREE! It takes less than 2 minutes to set up with your TGS rep.
Help drive traffic by offering an incentive. This could be a discount, a two for one or get as creative as you like. Make it easy for teams to make group reservations through the mobile app & web. You can offer small or large party reservation options. Sit back and relax as you make money from the increased business you will receive from the event! Don’t Wait Get Started Today!